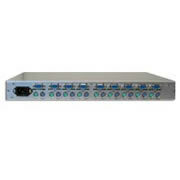 KVM switch 1U rackmount, 16-ports Combo. Using Standard Combo cable for PS/2 or USB Keyboard, Mouse. High Video Quality - Up To 1600X1200 resolution. Local console: 1 DB-15 VGA, 2 USB for keyboard and mouse.